One of the features I was looking forward to with MobileMe is the ability to send large files without bothering with FTP. There is supposed to be a feature that allows you to easily email a link to a friend that allows them to download the file directly from you MobileMe storage. Unfortunately, Apple has yet to flip the switch on this feature. However, this is already available on SugarSync. You can even send a file from your iPhone. That is actually an impressive trick over the lunch table. I am fortunate enough to have two Macs. I keep one at home and the other follows me around. To make matters even more confusing, there is a PC box on my desk at the office. My challenge was to figure a way to keep the files synced between these various computers without becoming a slave to a thumb drive. These are the kind of problems that make my little geek heart go pitter-patter, obsessing over making sure everything is in sync rather than doing any actual work. I tried a variety of ways to solve this problem ranging from thumb drives to iDisk and I wasn’t particularly happy with any of them. My biggest problem with these solutions is the way they add steps to my workflow. I don't want to have to think about copying and synchronizing files every time I move from one computer to the next. I just want it done. Like Picard in his dome-headed glory, I just want to look at my Mac and say "Make it So." So in this quest for syncing Nirvana, I came across SugarSync. SugarSync gives you a local client (either PC or Mac) in which you plug in your account information and tell it what data gets synched. I’ve got big chunks of my documents folder going up along with my OmniFocus datafile, Bento database, and several other items I want to have everywhere that are buried on my hard drive. You then log in on the other computers and tell them what parts you want synched locally (you can also leave them in the cloud). Once that is done, you are good to go. If I make a change to that little text file that keeps my grocery list, it goes up to SugarSync and then back down to my other Synched computers lickity split. This is really convenient when you are busy trying to figure out world peace but can't stop thinking about making 'smores. The multi-platform support does not stop with the Mac and PC. They also support the new "third" platform. The iPhone. 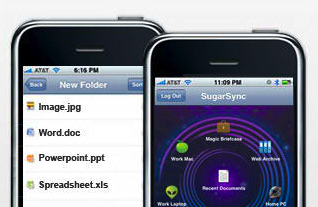 SugarSync has an excellent iPhone web site that allows you to access all and view most of your files. So when I'm sitting in the market I can pull up the grocery text list. Graham crackers, marshmallows, hershey bars ... Check! You can also forward the documents from your iPhone as an email attachments. SugarSync already has Windows Mobile and Blackberry clients and I'm going to assume they'll prepare a native application for the iPhone but its web interface is already pretty good. SugarSync also has a photosharing component that will work with your cell phone. I confirmed this does work but I haven't used it extensively. Unfortunately, all this syncing goodness comes with a pricetag. There is a monthly fee. The limited number of files I sync easily fit in the 10 GB limit which results in a monthly charge of $2.49. SugarSync has more expensive varieties that scale up to 250 GB for $25 a month. There is also a price in clock cycles. As I sit here writing on my MacBook with 5 applications open, SugarSync is using .3%. Earlier it was at 7% and when it is actually syncing it ramps up higher. I also don’t like the way its icon insists on staying in my dock. This is the kind of application that should stay in the menubar only. Another pestering problem is the inability to remove a machine from your SugarSync list. I had some problems with one of my Macs recently that resulted in it getting several logic boards and eventually replaced. SugarSync treated each of those logic boards as a separate machine and, as a result, I have 3 machines on my SugarSync account that no longer exist. The developer agrees this is a problem and promises to take care of this with an upcoming client. Lets hope that is soon. Another problem with SugarSync is that it doesn’t always play nice with packages like sparse bundles. You also have to consider the fact your data is going out into the cloud. The developer explains that the transmissions are all done on a secure connection and the data is also kept secure on the SugarSync servers. In terms of stability, I've been using it a few months now and not experienced any problems or loss of data. Be warned however there are reports on the web of people losing data. Don't forget that syncing data through any system without first having a reliable backup is something like parachuting without a parachute. While SugarSync is doing the job, I think there are going to be several credible competitors in the near future. MobileMe may get it done for its subscribers and I'm currently in the beta for Dropbox which looks very promising and will probably get its own review when it comes out of beta. Dropbox already appears faster than SugaSync although it does not have such a friendly iPhone interface and, in the current form, does not sync folders all over my hard drive. Instead it has its own dedicated folder in which you must keep files. Taking all of this into consideration, I’d recommend the monthly, and not the yearly, SugarSync subscription. SugarSync has a free 45 day trial and if you are looking for multi-platform syncing bliss, give it a try. Hey gang, I'm back after landing on my back with the flu. Thanks everyone for writing to ask what was going on. So anyway, yesterday I did my usual routine of diving into OS X upgrades without blinking. It worked out fine except SugarSync garbled up on one of my machines. Today, when I finally started feeling human again, I emailed them and had a response back within 30 minutes with the required fix. Impressive. So as the readers know, I've been obsessing over synchronizing files lately. I had a pretty good solution figured out using my .Mac iDisk and even made a nifty little Applescript to deal with that pesky Bento. For the last week however, I've been trying a new online synching service called SugarSync. I've even been talking about it on some of the various podcasts. SugarSync gives you a local client (either PC or Mac) in which you plug in your account information and tell it what data gets Synched. I've got big chunks of my Documents folder going up along with my OmniFocus datafile, Bento database, and several other items I want to have everywhere. I then log in on the other computers and tell them what parts I want synched locally (you can also leave them in the cloud). Once that is done, you are good to go. If I make a change to that little text file that keeps my grocery list, it goes up to SugarSync and then back down to my other Synched computers lickity split. I even have the PC version loaded at work and keep some of my forms synched. I haven't got to the point where I feel comfortable sending client files up into the interweb. 1. It is faster, much faster. My iDisk solution involved a second step that included a Chronosync pass. Put simply I was afraid that if the iDisk went nuclear, so would my data. With SugarSync it is not necessary to add that extra step but even if I skipped that and just used the iDisk solution, it still can't keep up with SugarSync. I can close out OmniFocus and then walk ten feet to the other computer and open OmniFocus. By that time it will have already grabbed the database file from SugarSync. The PC Sync works. This makes it really easy for keeping things working between the Mac and PC. My PC sync is very limited but it works just fine. 3. It works on your Phone. They have Windows mobile and Blackberry software. They also have an iPhone friendly site that allows you to see all of your files. You can access some of the files directly and email just about all of them from your iPhone. SugarSync has some nice benefits but comes at a price. The revised pricing plan is 30 gigs for $5 a month. The price just doesn't come from your wallet. It also costs a few clock cycles. As I sit here working on my MacBook Air with 7 applications open, SugarSync is using .1%. I've seen it higher though. Earlier it was at 7% and when it is actually syncing it ramps up higher. My other two big concerns are security and reliability. The developer explains that the transmissions are all done on a secure connection and the data is also kept secure on the SugarSync servers. I need to investigate further to see exactly what that means. I frankly don't care if someone figures out how to access my grocery list or MacSparky ramblings. Client documents are, obviously, a different question. Likewise stability is critical. Last week David Pogue and Walt Mossberg gave SugarSync positive reviews and their servers were understandably slammed. Regardless the system was down so it was pretty much useless for a day. If that trend were to continue, I'd lose interest pretty quickly. They have a free 45 trial so if you are interested, head over and try for yourself.